TPS (Teachers, Parents, Students) Publishing Inc. is a teacher/writer group focused on providing innovative inquiry based STEAM programs, TK-G12, to exactly align to Common Core Mathematics, NGSS and by State curriculum for Math, Science and Forensic Science. Programs include STEM and Arts inclusive projects. 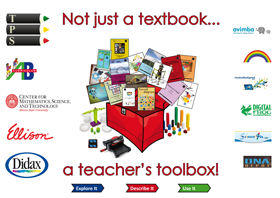 TPS has created a teacher toolbox offering you an opportunity to use career targeted, exciting project based learning tools together with traditional practice. Texas ELAR K-8 STEAM programs - 100% TEKS aligned, now available.